Jac took his furthest trip yet when he headed out from Ohio to Massachusetts to visit the Equine Affaire (November 2013). He had been hauled shorter distances and was traveling with other horses which helped him stay relaxed. Some horses won’t drink much when traveling but Jac caught on well. Jac spent most of his days in the Celebrity horse stalls where people could see him and take photos of him or with him. Jac also was brought out for appearances and was completely at ease there. 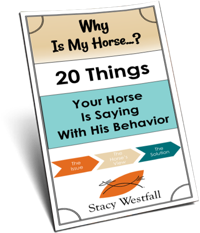 Although Jac had spent time at the Quarter Horse Congress preparing for his debut at the freestyle reining (see Episode 28) he had not been ridden in front of a crowd. At 2:08 I chose do ground work during the introduction where it was likely that people would start clapping. Watch the video below for the answer! Choosing not to be mounted is a demonstration of prevention. I also made a plan for how I would handle Jac’s reaction to the crowd clapping…if he had a reaction. Preparing myself ahead of time by thinking about what I will do helps me feel more secure. I chose to keep Jac mentally ‘busy’ and tell him what TO do. Many people wait until the horse has the reaction before they decide to do something; by then they are behind. I was able to channel Jac’s reaction to the clapping. If Jac had not reacted, the whipping around him would have been the same as any other day at home. The exercise was familiar to Jac before this situation where it was needed. This is another example of prevention. Horse people are too funny! I love it! After that the crowd felt comfortable clapping and Jac acted like he was a seasoned pro. Was all the prevention necessary or was Jac just destined to accept things like this? When prevention is used often times the answers are elusive because the problems are never encountered-which is the point. If you have been watching Stacy’s Video Diary: Jac for very long you might have noticed that the footage hasn’t been ‘live’. Filming and editing is hard work! And if they had been ‘live’ we all would have experienced a two month delay while Jac was sore. We are, however, almost caught up to real time and you will notice in the next couple of weeks that we are releasing very close to real time (filming is still hard work and requires editing). Jac and I will be at Equine Affaire in Columbus, Ohio April 10-13th (link to the schedule here). Stop by and visit one of the demonstration or the booth. Jac is in the Celebrity Horse Stall again too! Keep your eyes open when your driving…you might just see us driving down the road! Stacy Keep going! You both will be more than amazing as both keep showing up in more public events since the horse will become more comfortable of it. Jac is coming along very nice! Congrats to you and your long love affair with the horse!!! Wished I was closer to see you and him in person..
Jac was born on March 14, 2011. I took him in training March 9, 2014. The saddling, Episode 15, was filmed on March 23rd. Starting mounting in April. Looking forward to seeing you and Jac in Ohio next week!! We are on our way! See you soon! I love the idea of “preemptive” planning. That’s something I need to work on! Great demo. May sound odd, but I could “feel” Jac’s eagerness to please in that arena. What a wonderful horse — and partnership! Thanks for the inspiration. i wish there was some way I could save all the episodes for future reference. we’re on fixed income, and retired, and don’t know how to save them. but thanks for all the help and pointers. This is so amazing. 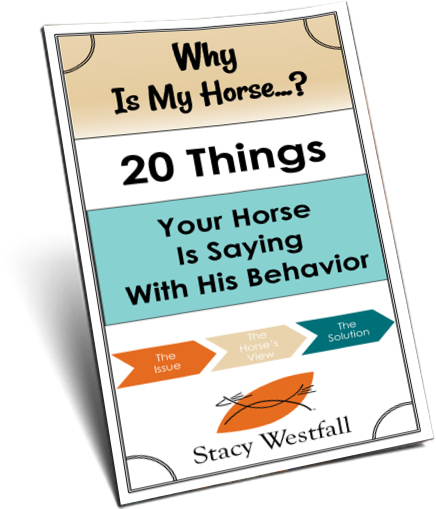 I think one of the best things this has helped me understand is just how long & how much work goes into training a horse. WOW! CAN you see JAC’s future yet Stacy???? …… WE SEE IT!!!! …. He sure looks good…. Hopeful!